Ubisoft has confirmed Assassin’s Creed Odyssey’s New Game Plus mode will release later this month. The tweet doesn’t give very much away – in fact, Ubi had to explicitly confirm that it was indeed pertaining to Odyssey a little later in the thread, so confused were commenters – so right now we can only guess what the mode might encompass. 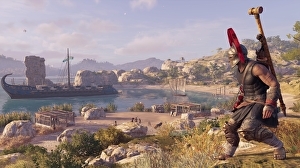 We won’t have to wait long for an update, though; Ubisoft promises to share more information about the New Game… Read original at Eurogamer — https://www.eurogamer.net/articles/2019-02-10-new-game-plus-coming-to-assassins-creed-odyssey-later-this-month URL of source article.